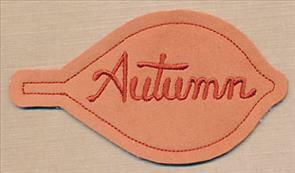 Welcome the crisp autumn breeze and fall flavors into your home with new seasonal designs! 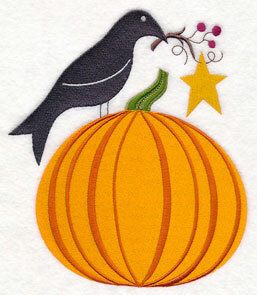 Pumpkins, apple cider, fall leaves, and more can be found in these designs. 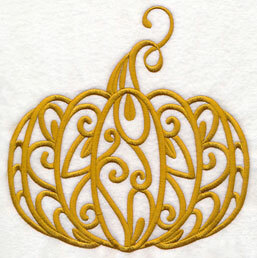 Fall treats shine on projects for your kitchen, while goldwork motifs add an elegant look to any Thanksgiving table setting. 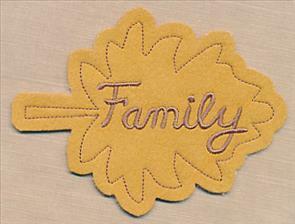 Plus, new in-the-hoop leaf tags will bring a crafty look to any hostess gift! 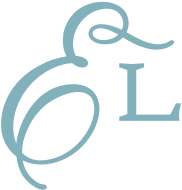 Scroll down the page to see these vibrant new designs! 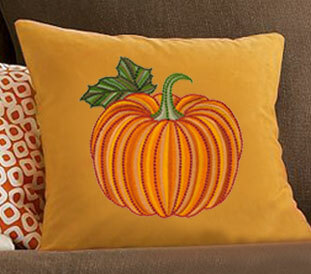 Bring the sights of autumn into your home with your new favorite pumpkin on a pillow! 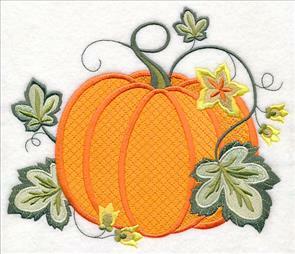 Elegant details and unique stitches combine to create this sophisticated pumpkin design. Varying levels of texture and color combinations give the classic autumn motif an impressive adornment for pillows, totes, and more. 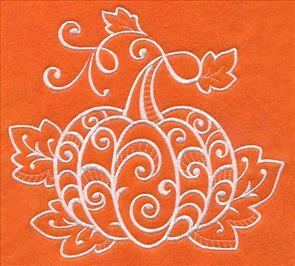 7.79" x 7.43" and 7.08" x 6.76" and 6.14" x 5.86" and 5.09" x 4.86"
Pumpkins are always a favorite when stitching for the fall season -- here white thread takes center stage in these new variations. 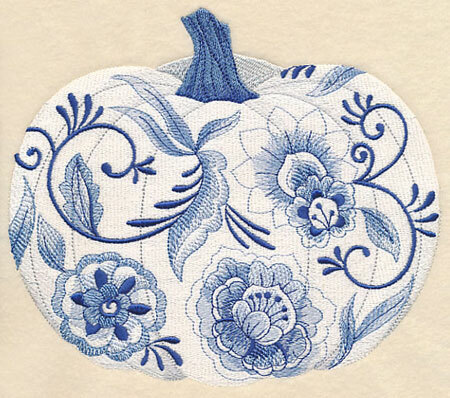 On the left an intricate design in white offers eye-catching accents; on the right a whitework pumpkin stuns on orange fabric. 7.69" x 7.81" and 6.86" x 6.97"
5.86" x 5.95" and 4.88" x 4.95"
7.27" x 6.86" and 6.21" x 5.86"
5.15" x 4.86" and 3.87" x 3.65"
Beautiful Delft blue details adorn this pumpkin with the classic artwork of the Netherlands. 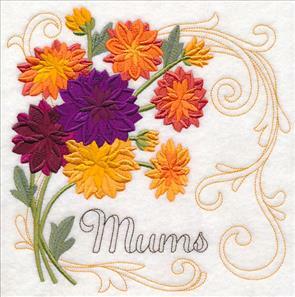 Autumn flowers, leaves, and swirls add stunning style. 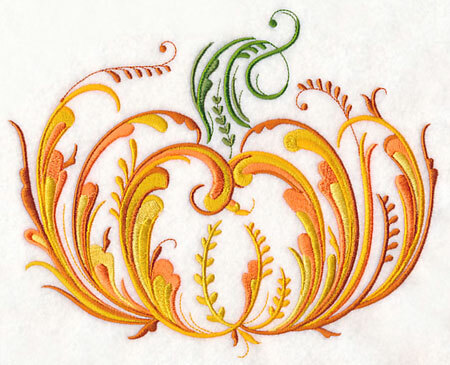 7.80" x 6.75" and 6.73" x 5.83" and 5.60" x 4.85" and 3.87" x 3.34"
Stitch a primitive pumpkin on kitchen towels or welcome flags; a Jacobean-inspired option is perfect for Thanksgiving decorations or fall pillows. 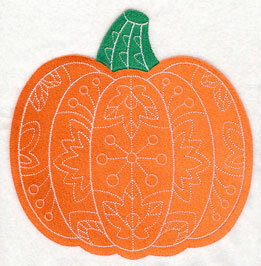 Stitch your favorite pumpkins together for a seasonal look! 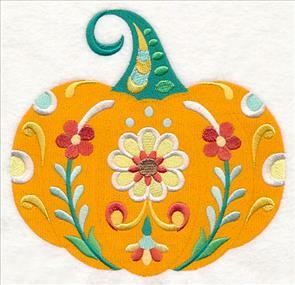 7.81" x 6.77" and 6.76" x 5.86" and 5.60" x 4.86"
Rosemaling folk art stems from Norway, and gives this pumpkin design an ethereal, whimsical appearance. The elegant design features open spaces where the fabric shows through, making it great for stitching on solid, low-nap fabrics. 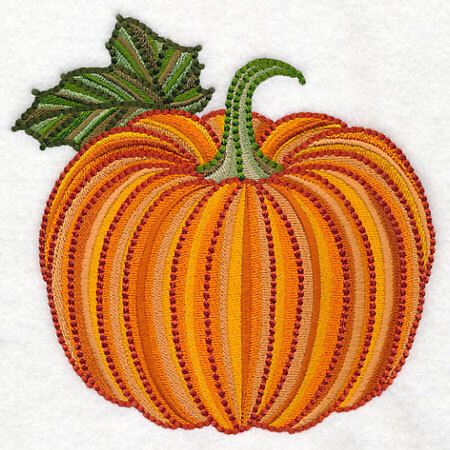 8.50" x 6.85" and 7.82" x 6.30" and 7.26" x 5.85" and 6.01" x 4.84"
Add a burst of color to your pumpkin embroidery with these two motifs. 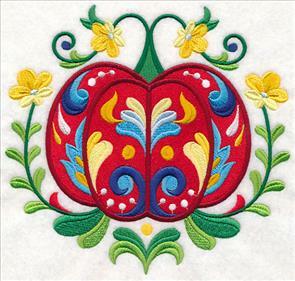 The design on the left features classic Scandinavian details while the version on the right has been created in the Flower Power style. 7.37" x 6.90" and 6.22" x 5.82"
7.23" x 6.85" and 6.18" x 5.85"
5.12" x 4.85" and 3.86" x 3.65"
Savor the sweet flavors of fall with these tasty designs. 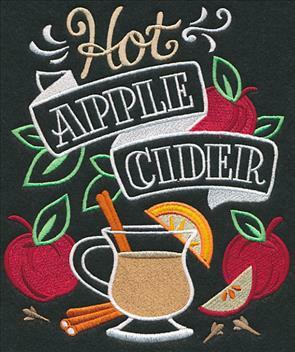 Hot apple cider and apple crisp will bring the tastes of autumn to any kitchen project! 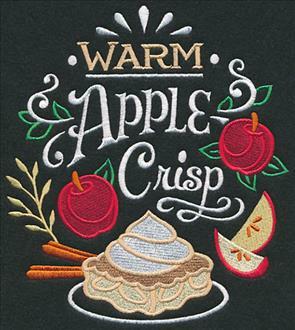 6.87" x 7.66" and 5.88" x 6.56" and 4.88" x 5.45"
Tea towels, aprons, and kitchen decor will get a seasonal update when adorned with these chalkboard motifs. 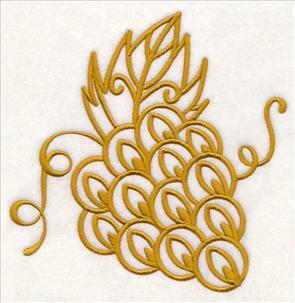 Embroider on black for a striking effect, or stitch the designs on a color to match your decorating scheme. 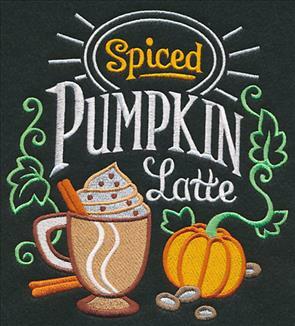 What says fall more than a spiced pumpkin latte or pumpkin pie? 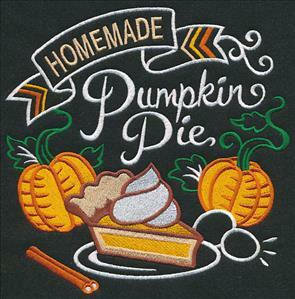 Perfect for Thanksgiving (or your favorite pumpkin lover)! 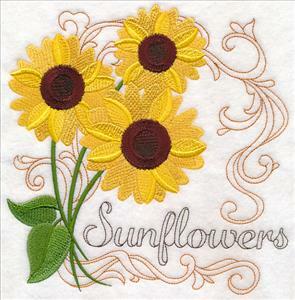 5.87" x 5.87" and 4.87" x 4.88"
Gorgeous fall flowers stun in the foreground of these designs, while light-stitching baroque details add a lovely effect in the background. Here mums and sunflowers show off their brilliant autumn blooms. 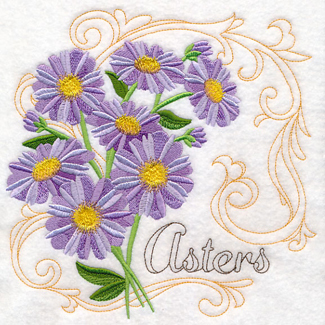 7.68" x 7.79" and 6.89" x 6.99"
Finish this trio of blossoms with a design featuring beautiful asters. 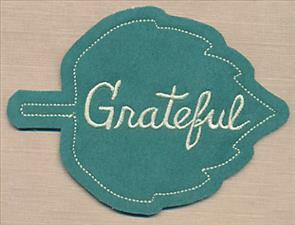 Great on pillows, totes, and more! 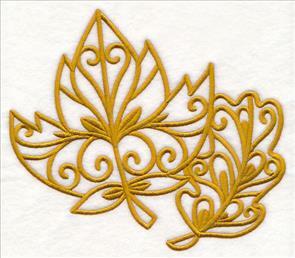 7.80" x 7.70" and 6.99" x 6.90" and 5.92" x 5.85" and 4.91" x 4.85" and 3.85" x 3.80"
Beautiful filigree accents and majestic gold thread give these fall designs an extra-elegant edge. 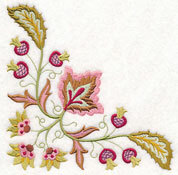 The graceful motifs are perfect for embroidering on table linens, pillows, and apparel. 7.81" x 7.81" and 6.86" x 6.87"
7.81" x 6.85" and 6.73" x 5.90"
6.11" x 5.36" and 5.55" x 4.86"
Add a gilded look to your table settings with these designs embroidered on a placemat. 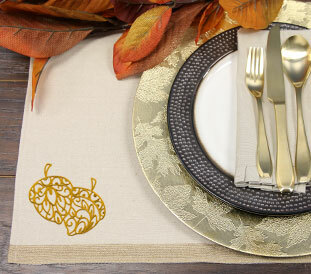 The sophisticated style lends a stylish look for any autumn get-together, or even for Thanksgiving! Get more table setting ideas in the Gather 'Round the Table Lookbook. A fall flower and pair of acorns continue the seasonal theme. 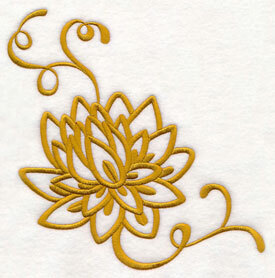 Stitch all six of the goldwork designs on a quilt, or add their beauty to a warm and cozy sweatshirt. 7.81" x 7.50" and 7.15" x 6.86"
6.11" x 5.86" and 5.06" x 4.86"
A bunch of grapes and tasty apple are perfect for adding to kitchen decor! 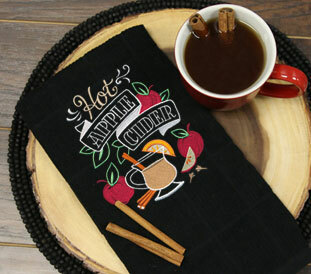 Wine bags, tea towels, and aprons all get a tasteful update thanks to these designs. 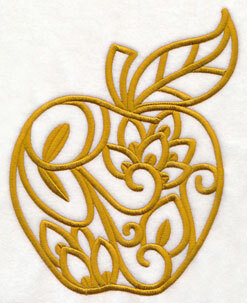 6.86" x 9.12" and 5.88" x 7.81"
5.41" x 7.19" and 4.86" x 6.46"
These goldwork designs are elegant additions to any fall project! Purchase them using the links above, or get them all in a design pack. 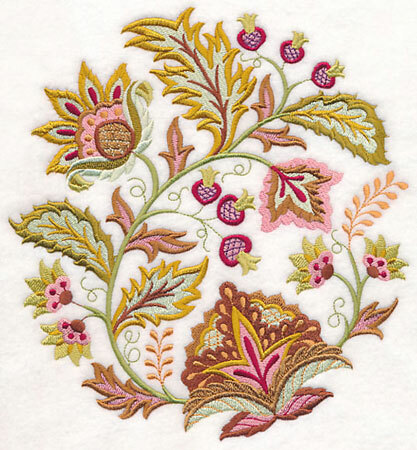 Rich, detailed Jacobean artwork is stunning when embroidered on pillows, table linens, and bedding. Stylish and graceful, this autumn version is sure to turn heads when added to your next project! 7.26" x 7.80" and 6.50" x 6.98" and 5.85" x 6.28" and 4.86" x 5.21"
A coordinating border and corner make it delightfully easy to stitch up a full set of matching projects. 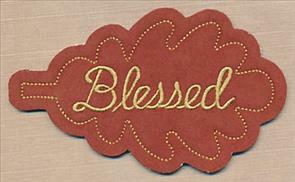 Add to a placemat, napkin, and table cloth. 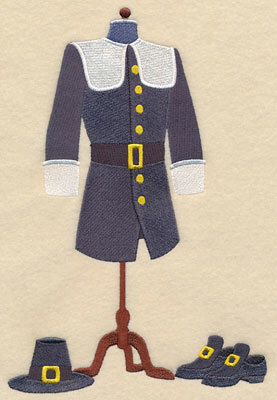 Or, embroider on a quilt and matching pillow set! 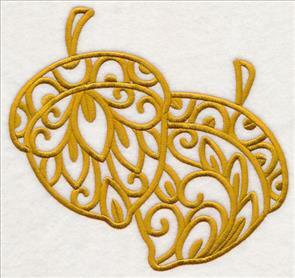 5.86" x 5.84" and 4.86" x 4.85" 3.86" x 3.84"
Elegant in-the-hoop leaf tags are a gorgeous way to prepare for the season! 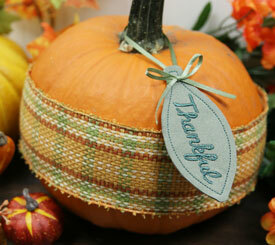 Stitch an "Autumn" tag and hang from a pumpkin, or add "Thankful" to your Thanksgiving table settings. 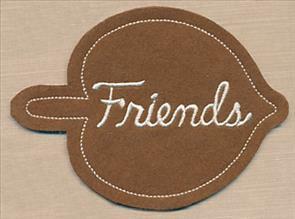 Plus, they're perfect for gifts, bottles of wine, and more! See how to make the tags (and get ideas for how to use them!) right here. 5.00" x 2.96" and 3.87" x 2.29"
5.00" x 2.51" and 3.84" x 1.93"
5.00" x 3.68" and 3.85" x 2.84"
Add these in-the-hoop tags to gifts, table settings, and more. Get them all now in a design pack. 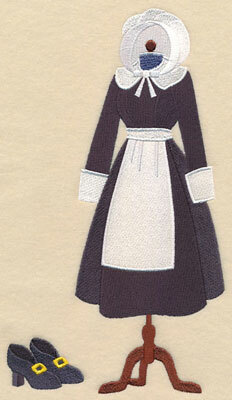 Mary Pat enjoys stitching the dress forms for various holidays, and was hoping we could add to the collection. Here a his and hers pilgrim pair are fabulous for Thanksgiving! 6.85" x 10.23" and 5.85" x 8.75"
5.81" x 10.15" and 4.96" x 8.67"
4.43" x 7.74" and 3.89" x 6.80"